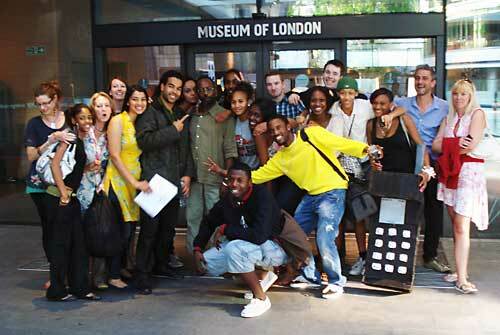 14 young people from the North Kensington area in London participated in a pilot initiative focusing on heritage, curating and creative video making - 'breaking into' the Museum of London. Working with the newly launched Galleries of Modern London, and assisted by museum personnel and creative film-makers, in a five day workshop, each young participant produced a film of 1 to 3 minutes, inspired by a particular object in the collection. Encouraging youth participation, the project, devised and led by Manifesta, with funding from the Heritage Lottery Fund, promotes innovative intervention in heritage curating as an exciting form of 21st century cultural activism and engagement - here using the medium of film/video, grounded in an intensive learning and production workshop experience (handling camera and sound; developing narrative ideas; story-boarding; directing; editing). 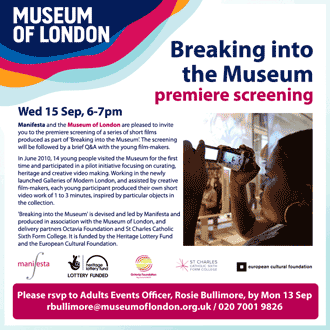 The 14 films produced provide a slate of challenging statements from young people aged 16 to 19 and from a diversity of cultural backgrounds – reflecting how they connect with ‘official’ history and heritage, as well as how they experience museum collections. The BBC recently commented and showcased the work here. A year later, the project travelled to Paris and took place at the Musée Carnavalet, with Tribudom. More information is available below here, and you can see the Paris filmshere. A selection of films from both London and Paris on the franco-german Broadcaster ARTE online. . The films are permanently anchored within the Galleries of Modern London in the Museum of London, thanks to the use of QR Codescaptions which have been added to each exhibit on which the young participants decided to focus in their films. From now on, when looking at the object in question, the public will be encouraged to upload the films, by scanning with their smart phone the QR Code placed alongside the exhibit. This is a first. View a selection of the London films here or watch all the London films (c.30 minutes) here. Breaking into the Museum in London is produced by Manifesta with the Museum of London, and partners Octavia Foundation and St Charles Catholic Sixth Form College. It is funded by the Heritage Lottery Fund.